I beheld the skull of a monstrous animal, the like of which I could not find in my zoological reminiscences. This head was much larger than the head of an elephant skeleton. And still it could not be anything but an elephant, judging by the skillfully restored trunk, which wound down to my feet like a gigantic black leech. But an elephant has no horns, whereas this one had four of them! The front pair stuck from the flat forehead slightly bending forward and then spreading out; and the others had a wide base, like the root of a deer's horn, that gradually decreased almost up to the middle, and bore long branches enough to decorate a dozen ordinary elks. Pieces of the transparent amber-yellow rhinoceros skin were strained over the empty eye-holes of the skull, and small lamps burning behind them only added to the horror, the devilish appearance of this head. "What can this be?" was our unanimous question. None of us had ever met anything like it, and even the colonel looked aghast. "It is a Sivatherium," said Narayan. "Is it possible you never came across these fossils in European museums? Their remains are common enough in the Himalayas, though, of course, in fragments. They were called after Shiva." Now you know why i'm hooked right? This amazing creature, as big as an elephant walked around as it pleased. Who in his right mind would pick a fight with a Sivatherium? Except maybe Shiva himself who seems to have bagged one for a wraparound. For our own species it was the Mesolithic age, and besides cultivation, we probably chased sivatherium too. With implements like these. 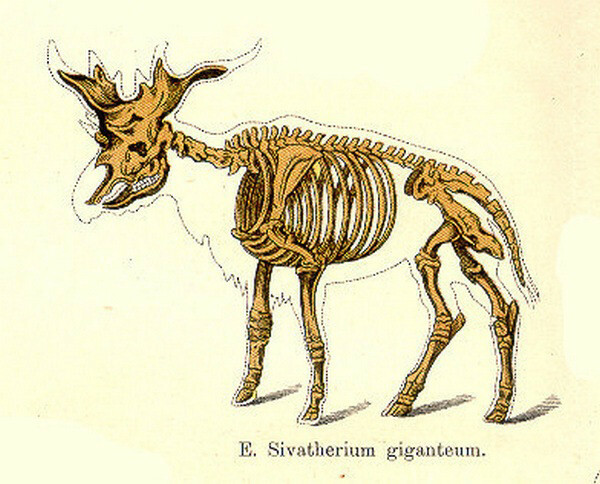 About the sivatherium itself, palentologists are still divided between whether it had a snout like an anteater, a trunk like an elephant or simply looked like the modern day giraffe. They have settled on describing it as belonging to the genus Girrafid. It was roughly the size of a modern day adult Indian elephant, and named after Shiva. It is assumed that the species went extinct about 8000 years ago. The first fossil specimen was discovered in the Shivalik Hills (Himachal Pradesh) in 1836 by the English paleontologists Hugh Falconer and Proby Thomas Cautley. Before starting drawing, you may want to research a little bit. This exercise made me think of direction actually... why is this animal so deadly? Maybe it has a weapon in every direction. The height and weight is also for protection. It does not have compound eyes like a butterfly which can see in almost every direction and evade attacks, and so can afford to be light and small. Basically, my perspective drawing from imagination is horrible. How does one improve that? I looked up pictures online and saw 4 different Sivatheriums on one illustration and this one caught my eye. Great attempt, Vijesh. Three powerful animals in one structure... awesome!